The Preamble to the Constitution of India lays emphasis on justice in all its forms: Social, Economic and Political. An effective justice delivery system requires that justice should not only be delivered on time, but should also be easily accessible to people, particularly people from vulnerable sections of society. In order to provide speedy and quality justice accessible to the ordinary citizens, there is urgent need to reform our judicial system. This process of reform must begin with an assessment of the country’s needs that the legal profession seeks to fulfil, namely, the requirements across various levels of the judiciary; gaps in the criminal justice system; specific areas within the law which will require an increased number of practitioners in the near future etc. Our approach to reform must be guided by a thorough understanding of current shortcomings and future needs of the system. Historically, the focus of judicial reform has been the judiciary. The lawyer – a basic pillar of the judicial system has often been ignored. Legal education and continuing professional development must create a socially sensitive lawyer of conscience, for whom justice delayed is not a commercial opportunity but a blemish on one’s professional persona and a failure of the system of which one is an integral part. The ideal Indian lawyer must not only have excellent legal skills, but also embody social responsibility and strong professional ethics. The efficacy of the rule of law depends to a large extent on the integrity of lawyers who are the link between the citizen and the system of justice. The first generation of judicial reforms in our country established the National Law Schools and have demonstrated that India can have institutions that impart affordable but world class legal education. The second generation of reforms should now focus on Continuing Legal Education of lawyers, judges, judicial officers, bureaucrats and academics. There is need for Seminars, Conferences, lectures etc. to be organized in a systematic manner, first making Continuing Legal Education accessible for all and then perhaps, making it mandatory as is the practice in many countries of the world. Due to globalization and opening up of our various sectors for foreign direct and indirect investment, new challenges in legal field are emerging. Cases relating to Intellectual Property Rights, enforcement of international commercial agreements, cyber laws etc. are increasing. Further, India has ratified, signed or adopted various International instruments and has made variety of commitments in different International agreements, treaties and conventions. Cases relating to our obligations and commitments made in these agreements like Bilateral Investment Protection Agreements, other treaties and conventions are also reaching the courts of law and International as well as domestic Arbitral Tribunals. Handling of these specialized kinds of cases requires great skills and experience. In some cases, role of international and domestic law also come into play together. Members of the Bar are therefore required to adequately equip themselves with competence to represent in those matters. 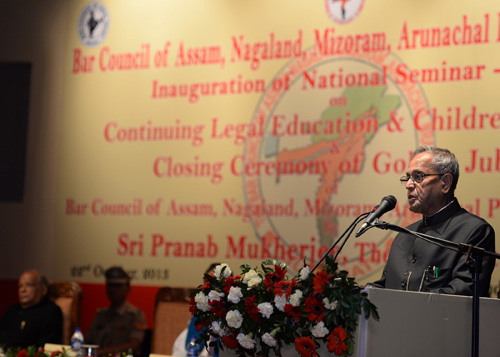 It is also imperative that continuing Legal Education Centers such as judicial academies be set up for enabling Judges keep abreast with emerging areas of Law, such as Cyber laws, Intellectual Property matters, matters pertaining to Computer and Internet etc. In these Centers, judges must have an opportunity to interact with distinguished people from various disciplines so that they can be made aware of ground realities which will help them in effective discharge of their onerous tasks. Establishing a comprehensive system of Continuing Legal Education will enhance professionalism, accountability and public respect for lawyers. Training Schemes such as the Rajiv Gandhi Advocate’s Training Scheme should be expanded so that young lawyers who have recently joined the Bar can take advantage of the same. It would be also useful in this regard for the Bar Council of India to consider setting up a world class institution for Continuing Legal Education similar to the National Law Schools. Now, let me turn to the subject of Juvenile Justice. The future of our nation depends on the proper upbringing of our children. When provided adequate opportunity and guidance, they have immense potential to contribute to society and humanity. But if neglected and deprived, they may develop deviant and destructive behaviour causing irreparable damage to society. Children require to be protected from exploitation, moral hazards, anti-social activities and brought up in a congenial atmosphere. They should have the opportunity to receive education, acquire comprehensive knowledge and develop in a child friendly environment so that they turn into good human beings with a mission in life. The legal child protection system in our country includes legislation such as the Prohibition of Child Marriage Act 2006, the Juvenile Justice (Care and Protection of Children) Act, 2000 (JJ Act, 2000) and the recently introduced Protection of Children from Sexual Offences, Act, 2012 (POCSO) etc. India is home to the largest child population in the world and more than one third of the country's population is under eighteen years of age. We are currently debating and grappling with several issues related to juvenile justice including the question of age and treatment of juveniles who may have the mental capacity to judge their actions. The reformative approach of the JJ law has come into question and there is demand for a law which has a deterrent effect, where the guilty are punished in accordance with the nature of the offence they commit, irrespective of their age. This debate is not exclusive to India. The thinking and understanding of juvenile justice across the world is still at a developmental stage. The discourse and law varies from one country to another, depending on their approach to human rights, their legal and technical capacities and their governance system. There is need for us in India to urgently grapple with and arrive at a consensus on the principles that should underline our Juvenile Justice system. I hope this National Seminar will make important contributions in this regard. The Protection of Children from Sexual Offences, Act, 2012 (POCSO) is one of the most recent initiatives for protection of children in India. This Act was introduced in 2012 to put in place a strong system for protecting children from any form of sexual abuse. There was a felt need for such legislation as statistics revealed that sexual crimes against children were steadily increasing. The incidence of minors getting raped in the country were seen to be on the rise over the past six years and in 2012 the figures touched the shocking number of 8,541. This Act has now been in place for over a year and even in this short period, several implementation challenges have emerged. These need to be urgently addressed in order to make this legislation truly effective. The Government has introduced in 2009 an Integrated Child Protection Scheme to implement the JJ Act. This Scheme, creates a safety net of Service Delivery Structures at National, State & District level; puts in place a cadre of trained personnel working exclusively on Child Protection; provides a range of need based services for each child and brings together existing initiatives and new measures for protection. However, reports such as the recent Justice Verma Committee report point out that the system often fails to comprehensively address the needs of the persons it has been created to protect – i.e. our children. Sadly, lack of information and sensitivity amongst service providers is among the principle reasons for the failure of the system. There is need for greater awareness of POCSO on the part of adults, parents, caregivers, teachers and people in positions of authority. Service providers at all levels also need to be sensitized and their capacities built. Bar Councils such as yours can richly contribute to strengthening implementation of this legislation and ensuring the operation of an effective, just, child sensitive Juvenile Justice system. I hope discussions in this Seminar will evolve a road map in the above regard. Both the themes chosen for deliberation are of immense contemporary relevance. I have no doubt this Seminar will witness a purposeful exchange and sharing of information and experience. I convey to all participants my best wishes.